Tall date palms, such as those surrounding Fairmont Royal Palm Marrakech, have long been a resting place and source of refreshment for sun-scorched travellers on their way to the busy markets of Marrakech. The 15-minute journey from Marrakech Menara Airport is far more comfortable these days, but arriving at this resort oasis is no less of a pleasure. 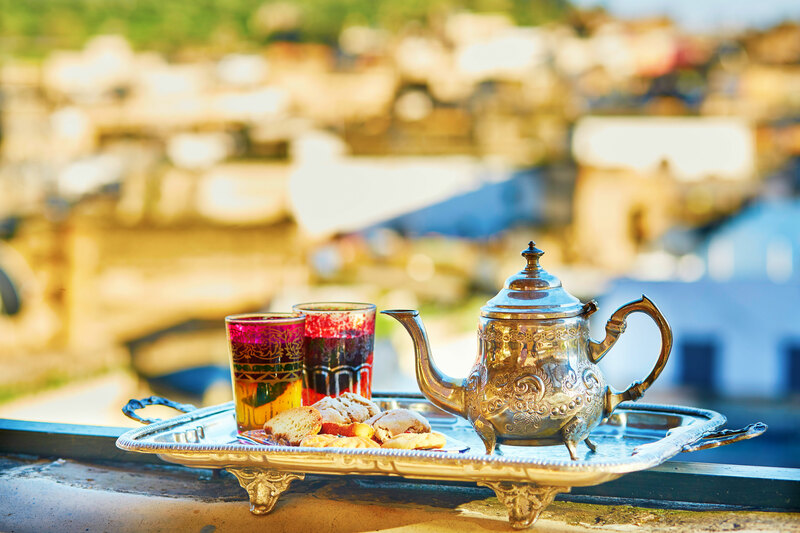 From tea to tagines, food and drink are tightly interwoven with the culture, history and traditions of Marrakech. Gourmets will be pleased to know that the best way to discover the “red city” of Marrakech is through its unique cuisine. Your first taste of Marrakech may come from a steaming, ornate silver teapot overflowing with fresh mint and loose Chinese gunpowder tea leaves. Moroccans drink tea so sweet it makes your teeth ache, but if you don’t mind a curious look, you can request little or no sugar. Steeped in tradition, tea is served everywhere, from humble homes to festivals, as a sign of hospitality. It’s poured waterfall-style from high above into small glasses, creating a slight foam at the top. The first cup is commonly poured back into the pot before proper serving. It’s also common – not rude – to slurp when drinking your tea. 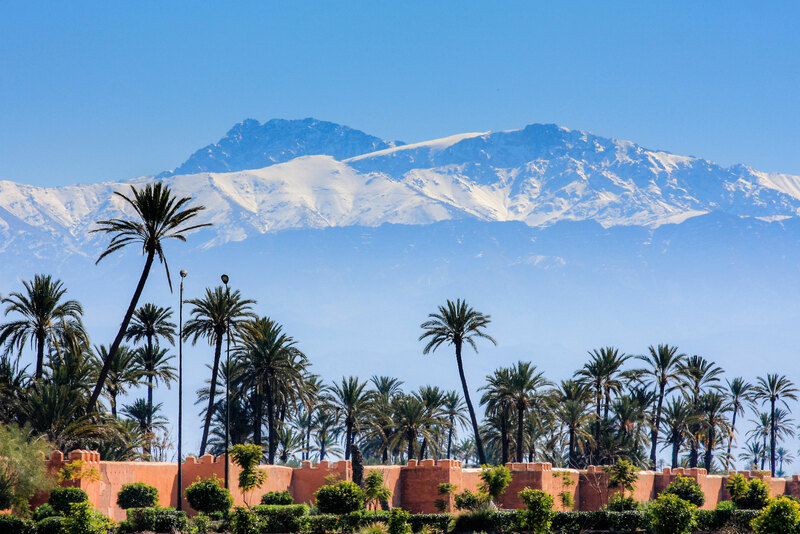 After slurping your share of tea at the clubhouse of the Fairmont Royal Palm Marrakech hotel's golf course while enjoying the gorgeous views of the Atlas Mountains’ snowy peaks, you can head into the medina, or city centre. At dusk, the clay-red city walls turn a smoky ochre colour and fragrant steam rises from the nightly food market in the huge central square of Jemaa el Fna. For hundreds of years, Jemaa el Fna has been a gathering spot for local craftsmen, Berber traders and travellers from all over Africa. Snake charmers, drummers and performers are always ready to entertain. The atmosphere is intoxicating, with the calls of stallholders and the smells and sights of steaming mutton, beef and chicken grilled in the open air and served by brusque, expert waiters at shared tables. Hungry? 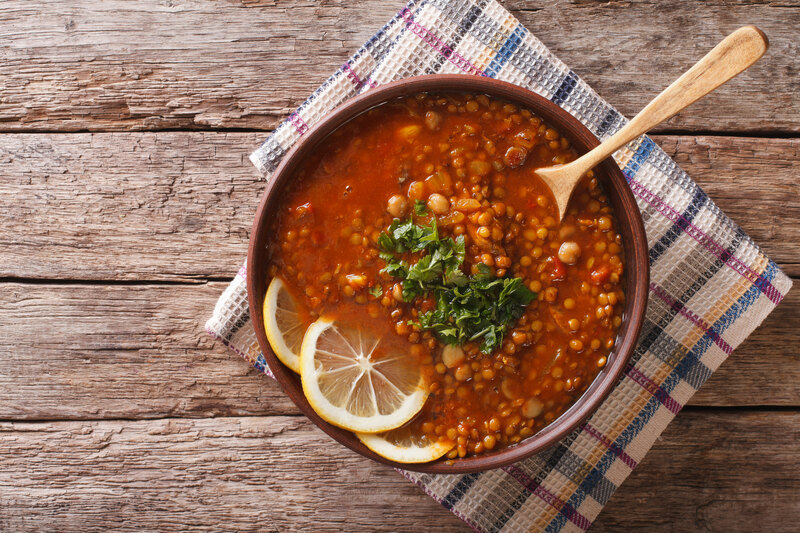 Try harira, a sweet-sour, tomato-based soup often served with boiled eggs, dates and lemon. The cultural significance of this dish runs deep. During Ramadan, harira and dates are used to break the nightly fast. Shakers on long wooden tables are filled with cumin, not pepper, and every last, spicy morsel is swiped up with roughly torn chunks of flatbread. To round off the meal, look for sweet stalls piled high with chebakia, a flower-shaped pastry dipped in honey-rosewater syrup and deep-fried. Patisseries sell a dizzying array of cookies, including crescent-shaped cornes de gazelle made with almond paste and orange blossom water. During the day, Jemaa el Fna is a laid-back destination with a scattering of stalls selling freshly squeezed orange juice, nuts and dried fruits. Horses and carts line up to give visitors a tour of the old city’s narrow streets, some of which feature restored riads. These large houses, based around a central courtyard, are often decorated with beautiful zellige mosaics and ornate mashrabiya woodwork. Many riads now host upscale restaurants serving traditional cuisine such as tagines, stews cooked in a distinctive clay pot with a conical lid. Classic tagines include lamb with prunes and chicken with preserved lemon. Almost all use a local spice mix known as ras el hanout – literally “head of the shop.” Interestingly for such a ubiquitous ingredient, ras el hanout is not a defined mix of spices, and every chef has a different combination of cumin, cardamon, cinnamon and other secrets. Couscous is another iconic Moroccan dish, usually only eaten by families after Friday prayers. 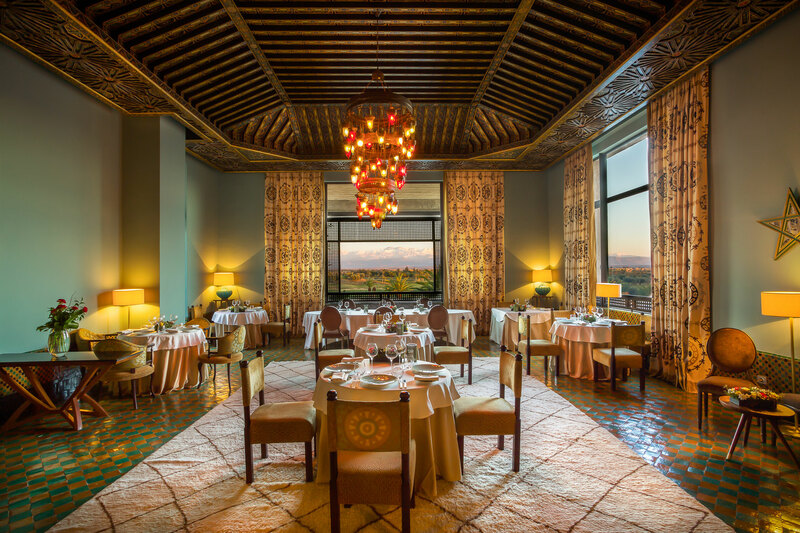 However, in upscale Marrakech restaurants such as Fairmont Royal Palm Marrakech’s Al Ain restaurant, you’ll find modern variations of this age-old favorite served throughout the week. Another specialty to look out for is méchoui lamb, slow-roasted on a spit until it’s so tender it falls apart on your fork and melts in your mouth. 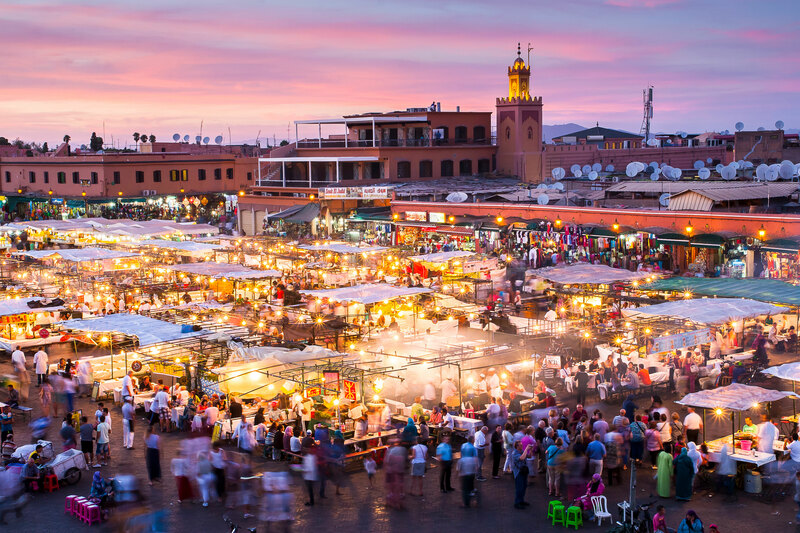 The souqs of central Marrakech are where the foods you enjoy at night are purchased and prepared by day. Heaped spices form a palette of colours and textures, next to jars of preserved lemons and buckets of olives of every size, shape and description. Bartering over the price of food or ingredients is not usual, but for other items it’s part of the fun. Take time to wander through the different souq areas: coppersmiths banging lanterns into ornate shapes, weavers working on colourful robes known as djellabas and leather workers crafting babouche slippers. Trades tend to cluster together, so competition between neighbouring stallholders is strong, and with a bit of light banter you can get good deals. The deeper you go into the winding lanes, the more authentic and less touristy the experience. Don’t be afraid to get lost, because you almost certainly will. If the heat from wandering gets too much for you, there are plenty of stalls to find refreshment. Try almond milk, made of real almonds, milk and rosewater or creamy avocado juice. Need something to nibble on? Order briouat, a pastry triangle stuffed with soft white cheese. Crumbly harcha semolina bread is another good choice. Drizzled with amlou, a liquid paste traditionally made with crushed almonds, honey and argan oil, it’s delicious. Argan oil, long-time Moroccan beauty ingredient, is no longer a secret, as celebrities worldwide praise its properties as both a superfood and a key element in luxury beauty treatments. Argan trees are endemic to the Sous Valley southwest of Marrakech, and their fruit is a favourite of tree-climbing goats. Argan oil is usually harvested by women from local Berber tribes, who crack the hard shells by hand before grinding the kernels and pressing, decanting and filtering. Pure argan oil, used in beauty treatments, is filtered many times. The culinary version involves roasting the kernels to bring out their full, nutty flavour. You may see clusters of argan trees if you take a tour from Marrakech to the coastal towns of Essaouira and Agadir. The Berber tribes who inhabit the area are famed for their hospitality, so you can expect not just tree-climbing goats but many glasses of sweet mint tea. Monica Guy is a seasoned travel writer and editor whose articles and guides have appeared in leading travel and hospitality publications and websites. Currently living between Germany and Morocco, she has written high-profile content for Time Out, Expedia, Hotels.com and Google, as well as numerous luxury hotels.